t is naturally absorbed by the body over time. Unlike some other treatments no artificial substances are left to remain under the skins’ surface. This means that the treatments are entirely reversible: they will naturally disappear over a period of months. We use a range of Q-Med Esthetic products: Restylane®, Restylane Fine Lines®, and Perlane® as well as Hydrafill® from Inamed. 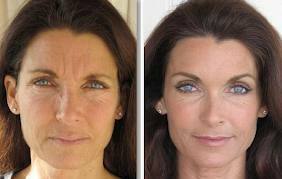 Both are Hyaluronic based fillers. They are sold in different quantities so it is possible to closely tailor the treatment to the needs of individual clients without incurring the cost of unused filler. Restylane® and Hydrafill® are safe and natural cosmetic dermal fillers that restore fullness to the skin to correct moderate to severe facial wrinkles and folds, such as nasolabial folds. Recent evidence suggests the hyaluronic acid actually does your skin good; it improves skin elasticity. The gel is injected directly under the skin in tiny amounts using an ultra fine needle or canula. After the injection your skin is gently massainstantaneous. The gel is injected directly under the skin in tiny amounts by an ultra fine needle or canula, resulting in minimal discomfort. To optimize your comfort during the short procedure, your physician may anesthetize the treatment area.